I’ve got a bone to pick with Catie, however, – there’s one big element of this cohosting marlarky that was emphatically NOT fun. How on earth to choose a favourite post!? It was so difficult with so many wonderful posts to choose from. And Catie’s favourite was The Mummy Fan Club (Members: 2) by Mess and Merlot. 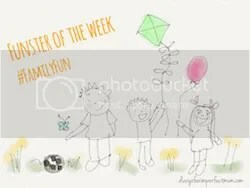 Now on with this week’s linky – come and join Catie in her goal to have more Family Fun! The linky will be open from 6am Thursday – midnight Saturday GMT. We will comment on all linked posts. 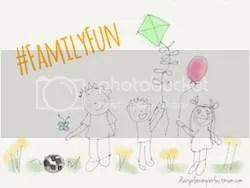 Please use #FamilyFun (Catie @animperfectmum & Lucy @puddlemother) on Twitter for a RT / like. And on the subject of social media, it’s always nice to share – if you like a post maybe give it a little tweet too! 4. By entering the linky you are agreeing to be added to an email reminder list. You can request to be removed at any time! The lovely Family Fun badge is below…if you’ve read all this then you know what I’m going to say, yes…off you pootle to Catie’s blog for the code! Next > I’m Going to #BML16 – A Blogging Bonanza!